Since the Civil War, African Americans have made great efforts to empower themselves. Focusing on Norfolk, Virginia, Earl Lewis shows how blacks have had to balance competing inclinations for conscious inaction and purposeful agitation as they sought to promote their own interests at home and in the workplace. 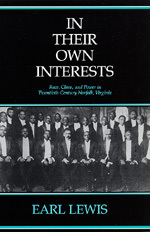 In Their Own Interests presents a cross-section of southern urban blacks—the power-brokers and lesser-knowns, Garvey followers and communist enthusiasts—who came to live in Norfolk between the Civil War and the Civil Rights Movement. Lewis seeks to recreate the texture of African-American life by examining the lives of the people after they moved to the city—the jobs and assistance they secured, the houses, families, and institutions they built, the battles they waged, and the culture they shared. In Their Own Interests moves African-American urban and social history beyond the current intellectual crossroads. Drawing on a variety of sources, Lewis tells the interconnected story of race, class, and power in twentieth-century Norfolk. His study has far-reaching implications and should be of wide interest. Earl Lewis is Associate Professor in the Department of History and the Center for Afro-American and African Studies at the University of Michigan.